US Capital Global Securities, LLC (“USCGS”) is offering 100 Membership Units in USCIM Fund XXXV Eventerprise, LLC (“Fund XXXV”), a pooled investment vehicle, on a “best efforts” basis. The Fund XXXV will be managed by San Francisco-based asset management firm US Capital Global Investment Management, LLC (“USCIM” or the “Manager”), investing in Preferred Stock of Eventerprise AG, LLC (“Eventerprise” or the “Company”). The Company plans to use the proceeds raised in this new equity offering for Sales and Marketing, Research and Development and for current and future general and administration needs. Eventerprise continues to develop a SaaS platform to meet the needs of the fragmented, global events industry. By connecting event vendors (suppliers) of all categories and sizes with potential clients (corporate, public, and private) in a transparent and centralized manner, Eventerprise aims to alleviate the weak digital presence of industry suppliers and establish much-needed industry benchmarks. The company currently operates with 12 permanent employees and was chosen out of 300 candidates to participate in the Alpha program of Readwrite Labs, a Silicon Valley accelerator. In addition, the Eventerprise talent incubation program combines experienced leaders with talented undergraduate and postgraduate students. On average, 20 students from top international universities are in the program and contributing to Eventerprise. A pre-revenue company, Eventerprise is preparing to commercialize its platform. The funds sought in this offering are to enable Eventerprise to develop its footprint in the 3 key markets identified in Company’s target market and growth strategy below (US, UK, UAE). To date, there are 14,123 suppliers listed and 207,777 files have been uploaded on the platform with 5,565 profile views and 10,987 searches in the last 30 days (as of December 17, 2017). 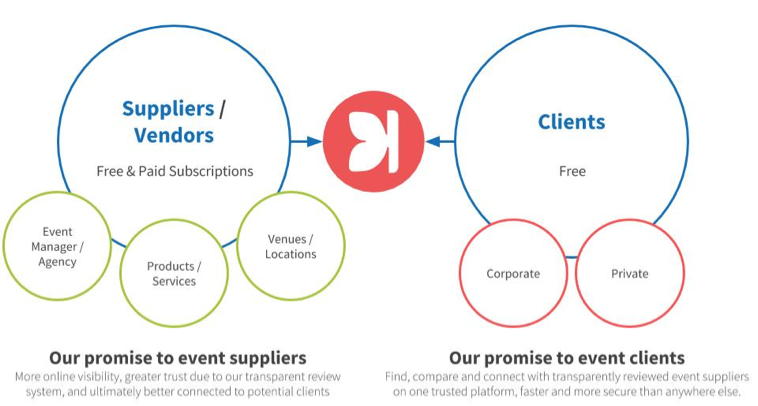 Eventerprise has developed a global events platform with a set of products and tools that aim to help suppliers better target and reach their target audience, and simultaneously allow prospective clients to find the venues, entertainment, catering and other services they need for their events in a more efficient and transparent manner. Eventerprise will focus market expansion on two key phases to maximize rollout and network effects: supplier activation and client-side demand generation. The plan is that supplier activation be initiated prior to client-side demand generation to ensure sufficient value is created for early-adopter clients, thereby accelerating traction in new markets. Hard launches in regions with the highest events activity will include full scale proactive market activation as well as public relations initiatives and a physical presence to better engage key stakeholders in the market. Soft launch markets will be activated exclusively via digital sales and marketing channels. Eventerprise’s international hub-and-spoke system will support global market activation by maximizing its reach while minimizing costs. See below for a 36+ month rollout plan into targeted markets. The Company plans to generate revenue through two primary streams with sub-streams: subscription-based revenue and value-added services-based revenue. EventerAPI - Software license agreement with technical or vertical cooperation partners giving them access to Eventerprise's data across all event categories and geographical locations. EventerJobs - First automated, digital recruitment platform for the global events industry which will reduce the time, effort, and cost of finding the right short-term and medium-term staff for any type of event. (1)	Equity contribution for 107,875 shares in the Company at a $25,000,000 valuation. The Company’s current valuation is blended based on the following valuation methods with an additional fifty percent (50.00%) discount to valuation: Discounted Cash Flows, Guideline Comparable Company Analysis and Multiples Analysis. (a)	For general Sales and Marketing, including professional and advertising, marketing and digital services. Additionally, the hiring of 21 additional team members in sales and marketing, content management and six additional management roles, including Chief Technology Officer, Heads of Sales and Head of Talent. (c)	Includes office expansion in Cape Town to accommodate staff increase, as well as additional people, professional, digital and other costs. (d)	Transaction Fees consist of USCGS placement agent fees of $400 thousand of the closing amount raised, and an annual management services, repayment of bridge loans from affiliated parties $160.0 thousand, and administrative agent fee of $25.0 thousand. * Pro Forma data is contingent upon a successful and full completion of the proposed $5,000,000 offering and execution by the management team. (a) Beginning in 2019, Eventerprise projects to be cash flow break-even before taking into account expansion costs. To maximize growth, Eventerprise assumes reinvestment of all free cash flow before expansion costs associated with growth. If Eventerprise decides in the future that profitability has priority over growth, Eventerprise can become profitable by reducing expansion costs. In this case the high Gross Profit Margin will translate also into Net Profits. Projections are based on the Hard Launch Markets (US, UK, UAE) alone. Gotz’s career spans over 20 years with experience in a wide range of disciplines including corporate leadership, project management, digital strategy, and marketing. He’s developed businesses on behalf of two of Germany’s largest consultancies, which was followed by the development of his own companies on two continents. Charlie founded Harlequin Marquees and Event Services in 1998, which became the Middle East’s leading turn key events business. Charlie took the business from inception through its exit with the Arena Group in 2008. The company subsequently IPO’ed on the London Stock Exchange in 2017. Extensive senior management experience with over 20 years in the airline industry, including time as Group Managing Director of Lufthansa’s Customer Service Network, where she looked after seven locations and 1,800 employees. Barry’s experience in marketing, spanning over a decade, includes programmatic advertising, digital customer experience, e-commerce, social advertising, and social media practiced across five continents and numerous verticals. Marc has a background in finance, law, and digital content management and brings more than a decade’s experience in business development as well as award-winning leadership within the international travel industry. With over 20 years of experience in UX design and development, Anthony brings a wealth of skills in both front-end and back-end development principles. Marc brings high-level experience to the Board as Managing Director of UniCredit Bank AG, Corporate & Investment Banking. As an international financing expert, Marc supports Eventerprise with all finance and legal matters. You should be aware that an investment in Units of the Issuer, and the Issuer's investment in Company Securities, involves considerable risks, including the possible loss of all or a material portion of your investment. Securities sold through private placements are not publicly traded and are intended for investors who do not have a need for a liquid investment. The abbreviated risks set forth below, as well as the detailed risk factors set forth in the Confidential Offering Memorandum and Supplement, are not the only risks facing investors. The abbreviated risks set forth below, as well as the detailed risk factors set forth in the Private Placement Memorandum and Supplement, are not the only risks facing investors. The Company has no history of revenue generation and has not proven its ability to monetize existing and prospective customers’ interaction with and time spent on the platform. The Company has not proven the profit potential of the business model, and even if the Company meets its revenue expectations, there is no guarantee that the Company will be profitable or that costs will not continue to exceed revenue. The Company assumes that a portion of the Supplier/ Vendors operating in the Event industry will subscribe to premium services and that Suppliers/ Vendors and Clients will be ordering value-added services. Assumptions in the business plan and the financial model may turn out to be incomplete or wrong. The Company is forecasting rapid growth, increasing the responsibilities and demands on its management team and operational/financial infrastructure. If the Company fails to successfully manage its growth, the Company’s business, operating and financial results would be affected. The event market and consequently the Company may be adversely impacted by unfavorable economic conditions, political or other developments, and risks in the countries in which its customers and stakeholders, such as its employees and contractors, operate. Existing companies may offer comparable services and become competitors and they may have greater financial resources, brand recognition and experience than the management or the Issuer. The SAAS market is characterized by rapid technological changes and rapid evolution of technological standards. The Company’s inability to adapt to technological changes in the industry could significantly harm its business, financial condition, liquidity, and the results of operations. The Company may not successfully scale and adapt its existing technology and network infrastructure to ensure that services and solutions are accessible within an acceptable load time. If platform security is compromised and/or the Company’s website is subject to attacks that damage customers’ access to solutions, customers may reduce, stop, or restrict use of services. The Company gathers, stores, and uses personal information, which subjects them to governmental regulations and other legal obligations related to privacy and security, including those of the European Union. Failure to comply with such obligations could harm the business. The Company works hard to secure superior talent for management, technology development, sales, and other areas when deploying business operations. Failure to identify, attract, and retain qualified individuals for the team could adversely affect the business.